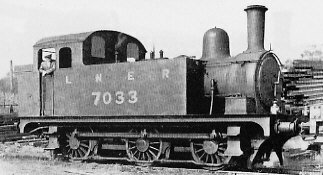 Designed by Hill, the Great Eastern Railway's (GER) Class C72s (LNER J68) were the final development of Holden's original 0-6-0Ts of 1886. A total of three batches of ten locomotives each were built in 1912, 1913-14, and 1923. The first batch was built for passenger services, whilst the second and third batches were shunting locomotives. Based on the J69s of 1904, the J68s had modern cabs with high-roofs, side windows, and square spectacles. The same boiler type was used, and the principal dimensions were the same. The passenger locomotives were built with screw reverse gear, balanced ten-spoke steel wheels, and condensing gear. In contrast the later shunting locomotives were built with lever reverse gear, and unbalanced sixteen-spoke cast iron wheels. Over time during LNER ownership, six of the passenger locomotives would be fitted with lever reverse gear, and wheels tended to get interchanged. No. 47 lost its condensing gear in 1919, and it was removed from the other passenger locomotives between 1936 and 1938. Between 1926 and 1930, the spaces between the bunker coal rails were filled in. At about this time, Ross pop safety valves slowly replaced the original Ramsbottom valves. From 1927, a number of J68s received LNER Group Standard buffers. Between September 1939 and July 1947, No. 7047 was fitted with a 160psi Diagram 69 boiler, and was hence re-classified as "J67/2" during this period. The first ten J68s were quickly put to work on the "Jazz" trains on the Enfield Town and Chingford lines. These were gradually replaced by N7 0-6-2Ts, but some of the J68s were still hauling these services at Grouping (1923). As they were taken off these services, the passenger J68s were used as passenger pilots. By 1935, five were at Stratford and the other five were distributed amongst sheds in East Anglia. The first batch of shunting engines were divided between Stratford and Peterborough East. The second (1923) batch of ten locomotives were allocated to Stratford. During the 1920s, some of the shunters moved to East Anglia country sheds, but some moved further afield including Worksop, Ardsley, and Boston. By 1935, the allocation was Boston (4), Stratford (12), March (3), and Lowestoft (1). In October 1939, No. 7041 was sold to the Government for use on the Longmoor Military Railway. In 1942 it moved to Bicester Central Ordnance Depot, and then to Military Port No. 1 at Faslane. It was disposed of in 1946. As with many other shunting locomotives, the arrival of large numbers of diesel shunters in the late 1950s marked the end. Withdrawals started in 1958 and were very quick. The last J68 was withdrawn in 1961. Heating Surface: Total: 996.17 sq.ft. None of the J68s survived into preservation. Finney and Smith produce a 3mm scale kit of the J68. London Road Models sell a 4mm scale kit of the J68. Connoisseur Kits sell etched brass kits of the J68 for both 4mm (OO gauge) and 7mm (O gauge).